Shower Remodel Video Series Introduction. Save money and avoid hassle- Armchair Builder :: Blog :: Build, renovate, & repair your own home. Save money as an owner builder. We would like to introduce you to a new shower remodel video series we will be publishing over the next week or two. We will be introducing you to some great new products that you probably have never heard of. We will also share with you some great quality tips to avoid extra hassles and costs while creating your dream bathroom. So, what kinds of cool products did we come across to include in our latest shower remodel project? Mortar Thinset Replacement. Have you ever worked with a mortar adhesive to set wall or floor tile? It can get messy at times. The other issue you can have with traditional tile adhesive is the quick setup time. You mix a little of the mortar and in no time it gets too thick to use. The product we found comes in a roll, applies like wallpaper, and can be grouted the same day you set tile. We can’t wait for you to see it. An Affordable Frameless Shower Door? Have you ever stayed at a fancy hotel and wished you could recreate the quality, custom look of a frameless, glass shower enclosure? We searched long and hard to find an affordable option to create a similar custom look. Well, we found it and want to share it with you. Bamboo Glass Tiles Paired with Subway Tiles? It can be hard to find affordable tile that looks good. 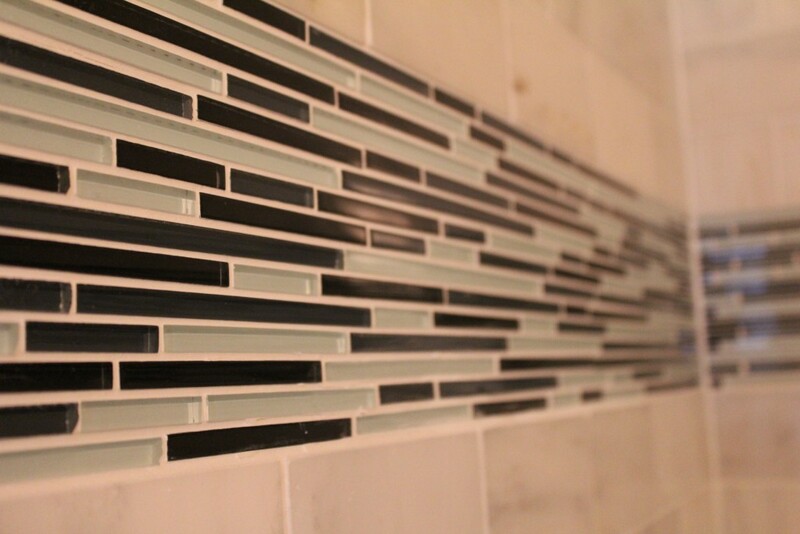 We found a stone subway tile with at polished finish and a high end look for our new shower. The subway tile would have been fine all on its own, but we found a thin, bamboo glass tile to use as an accent to give it more pop! We also plan to use the glass tile as a frame for our new mirror…more about that later. Cement Backer Board. We will discuss when to use a backer board and how to properly install it. Flat Surfaces. How can you ensure the flat areas in your tub or shower surround don’t leak. We will show you some builder tips for draining the water off of these areas. Waterproofing. We will share with you the roll adhesive product mentioned above that will also provide a water-tight backer to prevent deterioration and mold. We will also discuss the proper caulk to use for maximum effectiveness and to minimize maintenance. Design. 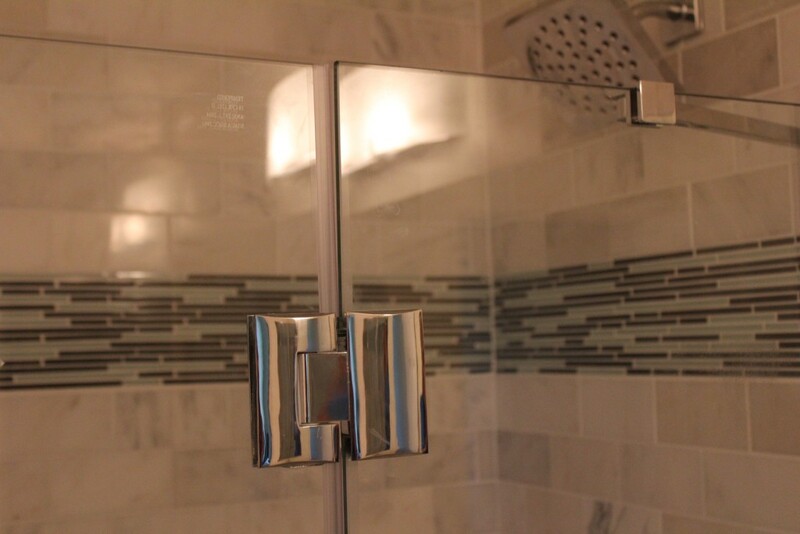 We will discuss the design of your shower and how it affects the overall ability to manage the water and moisture. We can’t wait to share our new shower remodel with you. But first, check out our video introduction below. Low Cost Bath Remodel…can’t find a cool vanity that meets your budget? We’ll show you how to get a designer vanity at up to 50% off. Tub and Shower Faucet Trim Replacement. Want a new look for your new shower remodel but don’t want to hire a plumber? We will show you how the trim kit will save you big money. Add a frame to your existing vanity mirror…create a whole new look in less than an hour. Why tear out your existing mirror…creating drywall damage and a big mess when you can just update your existing?